BEIJING - Discovered begging in a Beijing subway station, Zhang Shangwu - a former champion gymnast turned thief - has been offered a wide choice of jobs and help, thanks to two days of extensive media coverage. Depicted as a fallen star by the media, 27-year-old Zhang's micro blog has garnered 14,000 fans since it was launched on Saturday. 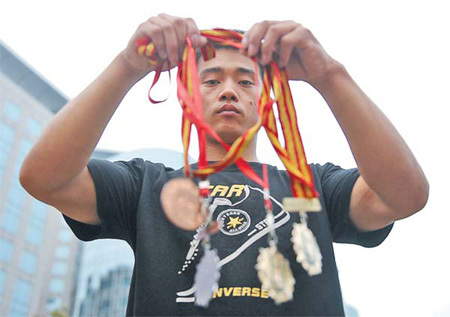 All the attention came after a passer-by recognized Zhang as the man who won a gold medal at the 2001 Beijing Universiade and took a picture of him begging. "It was a dreamy 24 hours," Zhang told reporters on Sunday. "Yang Wei, a former Olympic gold medalist and teammate, will meet me tonight", Zhang added. "I can't speak more about the other support I've received." A non-profit organization, and the owner of a hotel chain were reported to have expressed their willingness to offer Zhang a job, and the Championship Foundation, established by short track speed skating gold medalist Yang Yang, said the foundation is contacting Zhang to offer "appropriate psychological counseling". Though Yang Yang maintained "the most important thing is Zhang's own attitude". In 2007, Zhang was sentenced to three years and 10 months in prison after he was caught stealing two laptops, six cell phones and 31 MP3s from Beijing Xiannongtan Sports School and confessed to 10 similar offences. Zhang said he came to Beijing following his release from prison on April 12 this year, and has been sleeping under bridges or spending 10 yuan ($1.5) to spend the night in Internet cafes. "I've been looking for jobs. But my injury hurts when the weather changes and my head goes dizzy when I work hard," he said. "I'm no better than an ordinary man." Zhang told the news portal qq.com that he accepted all the media attention because he wanted to help his ailing grandfather and to raise the public's awareness about the problems faced by retired athletes. "I want the public to know how hard athletes train. And I want to take the opportunity to raise the public and government's awareness about retired athletes. I hope they can give more help to retired athletes." There has been heavy criticism in the media about how little help Zhang received from the sports system since a tendon injury in 2003 ended his career. Born in Baoding, Hebei province, and admitted to the national gymnastics team in 1995, Zhang won two gold medals at the Beijing Universiade. However, his promising gymnastics career came to a sudden standstill in 2003 when he suffered a tendon injury and failed to be selected for China's gymnastics team for the 2004 Athens Olympic Games. Zhang said he fell out with his provincial team coach after he was disqualified from the national team, when the coach refused his request for a recommendation to study at a sports college. Xinhua News Agency, however, gave a different version of events and reported that Zhang had violated the rules of the Hebei team many times and failed to change his behavior despite repeated counseling from his coaches and team leaders. Whatever the reason, Zhang received approval to retire from the Hebei Administration of Sports in 2003 and was compensated 60,000 yuan ($9,285).